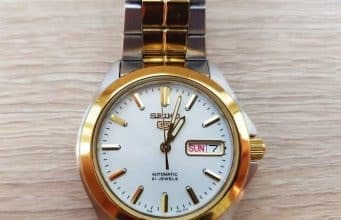 Home Watches Seiko 5 Automatic SNKK94 Review -The Best Watch in Its Price Range? 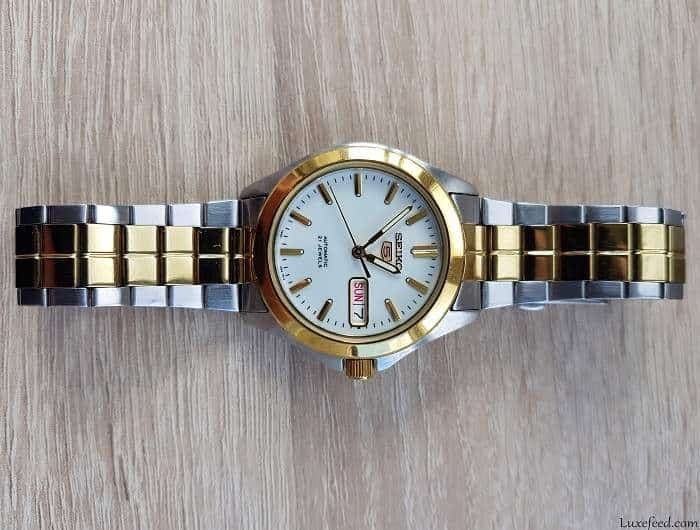 Seiko 5 watch review: Stainless steel with gold accents. The Seiko 5 watch for men is one of the Japanese brand’s most popular and recognizable products, as it manages to bridge the gap between affordability and premium quality. 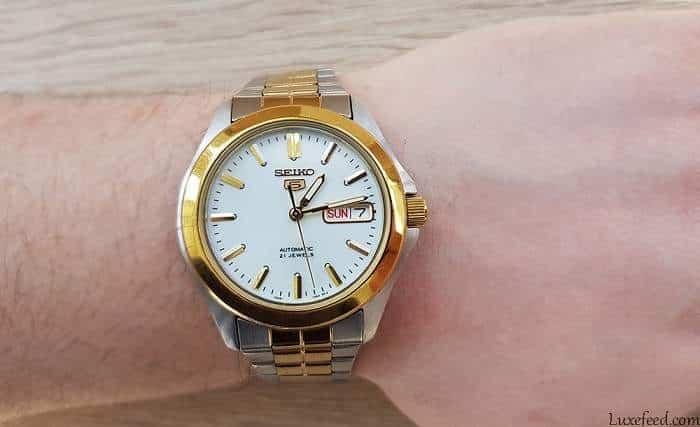 Our Seiko 5 review focuses on the SNKK94 model in stainless steel with gold accents – one of the more eye-catching variants of this particular Seiko 5 iteration. However, before we jump into the review itself, let’s find out exactly what Seiko 5 watches are all about, and what makes them so special. 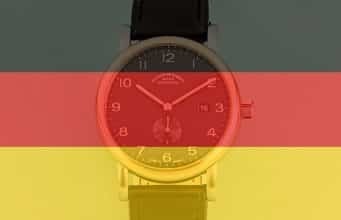 Usually, when we think about reliable automatic watches, we tend to give our trust to the Swiss. 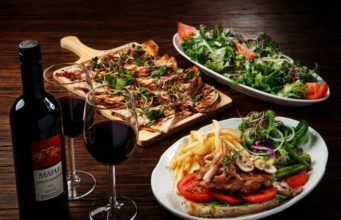 However, the Japanese have proven time and time again that their timepieces can be just as dependable, and more so, they can offer the same level of quality for just a fraction of the price. While the Seiko 5 can’t compete with the likes of Omega, Vacheron, and Patek, it offers the best bang-for-buck in its category without sacrificing on looks or accuracy. The Seiko 5 kicked off in the 1960s in an attempt to satisfy the growing needs of that particular generation. Therefore, each one of these watches brought five unique and useful features to the table. Upon leaving the factory doors, each timepiece had self-winding capabilities, water-resistance, a day-date function in a single window, a recessed crown at 4 o’clock, and a durable steel case and bracelet. As time went by, the Japanese watchmakers took some liberties with this design, especially when it comes to the crown position. Indeed, our SNKK94 model has a regular crown at the 3 o’clock mark, but it retained all of the other perks of the classic Seiko 5. In the 60s, not many companies were willing to introduce these unique features in a single package without asking for a premium in the process. However, the Seiko 5 became so massively popular due to its incredibly low asking price. To this day, this is one of the most affordable automatic watches that you can get your hands on. 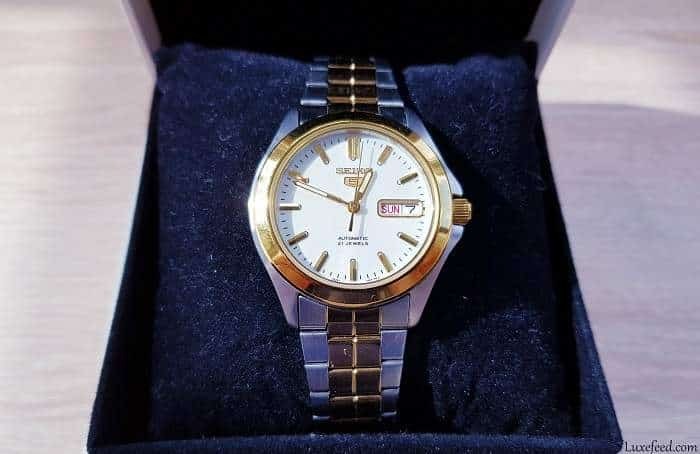 Moreover, it’s also one of the most reliable and accurate watches in its price segment, which makes it a must-have for anyone looking to buy an automatic watch without breaking the bank. At the time of writing, the Seiko 5 SNKK94 can be purchased from Amazon for about $126. 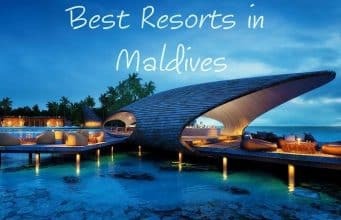 I’ll drop a link at the end of the article, just in case you want to get one for yourself. That being said, let’s kick off our official review of the Seiko 5, shall we? The SNKK94 is one of the smaller Seiko 5 iterations out there, as the case measures in at 38mm. That’s not necessarily a bad thing, especially if you have smaller wrists/hands. The design is pretty much identical to the SNKK87 apart from the colorway, as that particular model features an all-silver/steel look. The gold accents on the SNKK94 allow it to stand out, and it gives it a more flashy and expensive look. As you can see for yourself, the steel case boasts a simple gray look, but the golden bezel takes the center stage as viewed from the front. The golden hour markers and hands complement the bezel while contrasting nicely with the white dial. 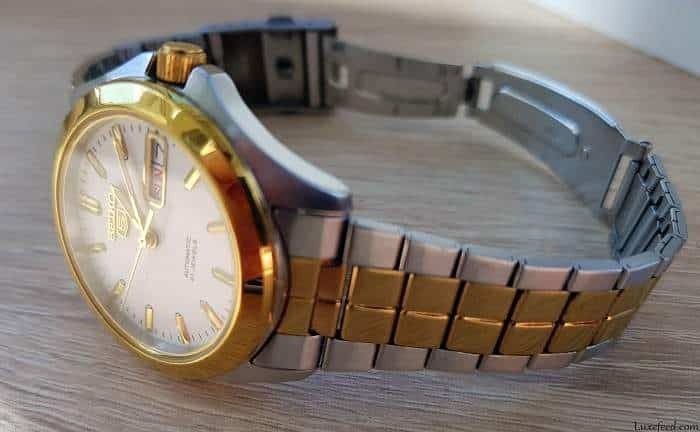 The crown boasts the same golden look, and even the Seiko 5 branding at 12 o’clock has the same color. The bezel surrounds the Hardlex crystal, which takes on the role of protecting the dial from the elements. Just in case you’re not too familiar with Hardlex, this is an in-house crystal that offers better scratch resistance when compared to standard mineral glass. However, it can’t hold a candle to sapphire. As for the crown, it can be found at the 3 o’clock mark, and it doesn’t allow for manual winding. Still, you can wind the watch yourself by shaking your wrist. This self-winding system makes sure that you never run out of power as long as you wear the timepiece frequently. Those of you who prefer to wind your watches manually might see this as a shortcoming, though. 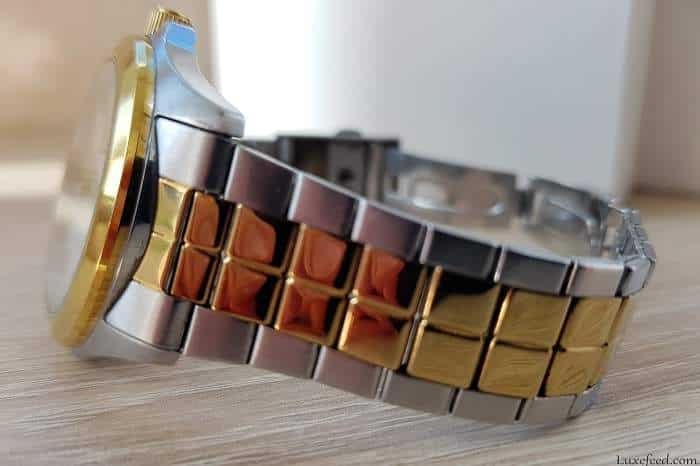 The back of the case is also made out of Hardlex, and it offers a glimpse of the in-house Japanese 7S26 automatic movement that powers the watch. This is a relatively simple-looking movement, as it doesn’t offer much in the way of decorations. 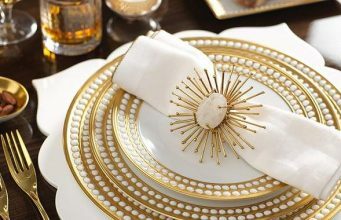 However, it does include 21 jewels, which is no small feat. The case boasts a water resistance rating of 99 feet or 30 meters. Officially, manufacturers wouldn’t advise you to submerge your Seiko 5 in water, as it could become permanently damaged. Showering with this watch is also not advised, but you shouldn’t worry too much if it gets a few splashes or if you wear it in the rain. As a matter of fact, some Seiko 5 owners took their watches swimming and reported no damage. It’s ultimately up to you if you want to take the risk or not, but I never tried swimming with this watch just to be on the safe side. Legibility is very good on the Seiko 5 SNKK94, as the hour and minute hands have received Seiko’s renowned luminous paint treatment – LumiBrite. The hour markers are not luminescent themselves, but each marker has a small luminescent dot at its end, which enhances readability in low light conditions. Seiko decided to skip both Arab and Roman numerals for this particular model, which means that we’re stuck with simple rectangular-shaped markers. 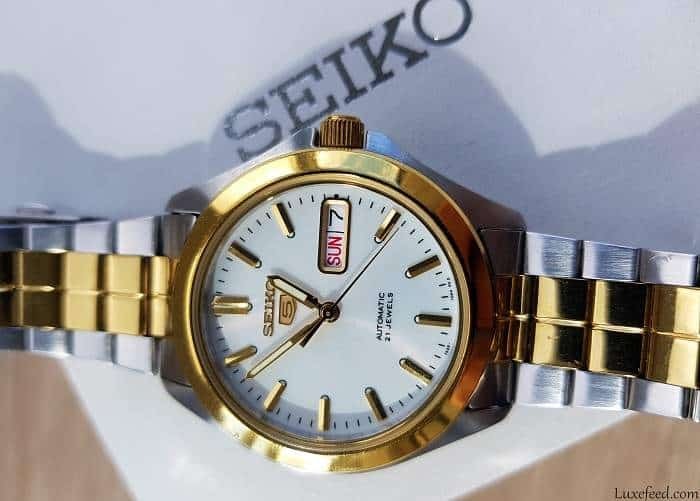 The Seiko and 5 logos are located at the top of the dial, right under the 12 o’clock mark, while the AUTOMATIC 21 Jewels print sits on the opposite side, above 6 o’clock. 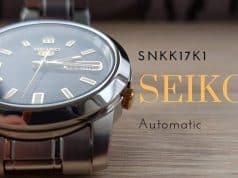 As we mentioned before, the Seiko 5 SNKK94 is animated by an in-house Seiko 7S26 automatic calibre, which includes 21 jewels. The movement operates at a frequency of 21,600vph or 3Hz, and it offers a power reserve of 40 hours. As for its main functions, these include central hours, minutes, seconds, as well as a day/date complication. As for its shortcomings, these would be the non-hacking seconds and the absence of manual winding. 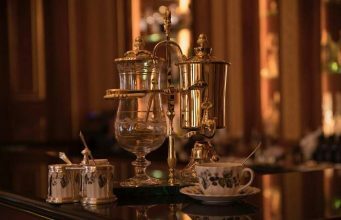 However, you only need to shake the timepiece for about 30 seconds to wind it up, and if you don’t even want to do that, you can just wear it regularly without worrying about running out of juice. In regards to accuracy, this watch is rated at -20/+40 seconds per day. This is definitely not as accurate as a chronometer, but we have to keep the price tag in mind. 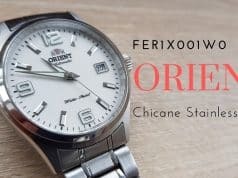 In its price segment (the sub $200 mark), this is one of the most accurate and reliable watches you can buy right now. In order to make sure that it always runs true, you can always adjust the watch once a week or every few days. Generally speaking, the watch shouldn’t run slower than 18 seconds per day. 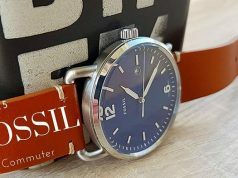 Personally, that’s something I can live with, but if you’re used to adjusting your watch once a month, doing it each week might seem a bit of a hassle for you. It certainly seems like Seiko poured most of its efforts into creating a decent automatic watch, but they had to cut costs somewhere. The bracelet is certainly not the most expensive in the world, but it is quite comfortable. On a full day of use, it does tend to tug on my arm hairs a bit, but it never pulled off hairs completely, which is a big plus in my book. The bracelet comes with folded links, and the clasp has a push-down button that allows for a quick release. Many Seiko 5 owners eventually decide to replace the standard bracelet with a more elegant leather strap, which should also enhance wearing comfort. However, there’s nothing wrong with keeping the bracelet, as it was designed to allow the wrist to breathe. This can come in handy if you plan to wear the watch for days at a time. Usually, I just wear it for 6 to 8 hours each day and I have no comfort-related complaints so far. Replacing the bracelet with a leather strap also raises the issue of cost. 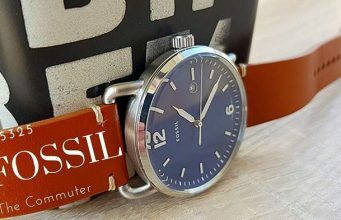 High-quality leather straps can end up costing more than the watch itself, which could defeat the purpose if you bought a Seiko 5 for its affordability alone. However, if you end up spending less than $300 in total for the watch and the strap, that’s still a very good deal in my book. The Seiko 5 SNKK94 is not necessarily a luxury watch in a true sense of the word, but it does feel like one at times. Its main selling point is probably the 7S26 movement, which offers decent accuracy and all of the benefits of a reliable automatic watch. Seiko did cut some corners when it comes to the bracelet and general presentation, as the box is definitely one of the simplest I’ve ever seen. You’re not buying this watch for the box, however, you’re buying it because it provides you with a chance to enter the automatic watch market at a steal. 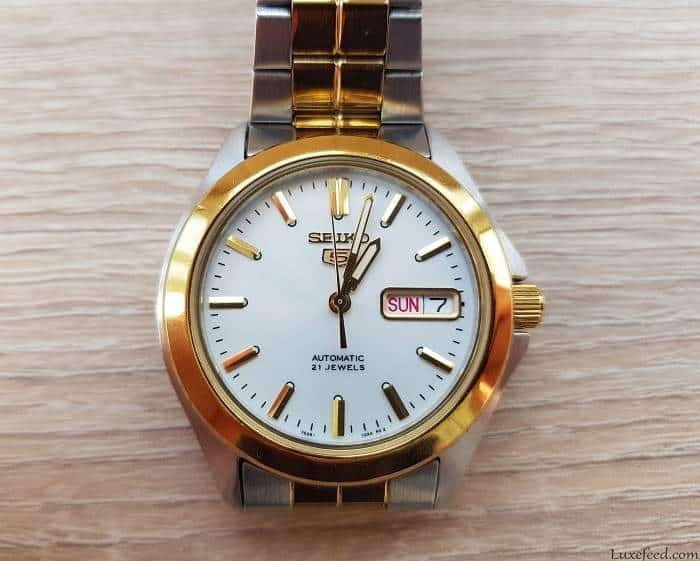 If you would like to buy a Seiko 5 yourself, I found this exact model on Amazon, but you should also cast an eye on the SNKK87 variant, just in case you’re looking for a more subtle, toned-down look. Case: 38mm diameter – 316L grade stainless steel – Hardlex crystal at the front, Hardlex case back – 99 feet of water-resistance. 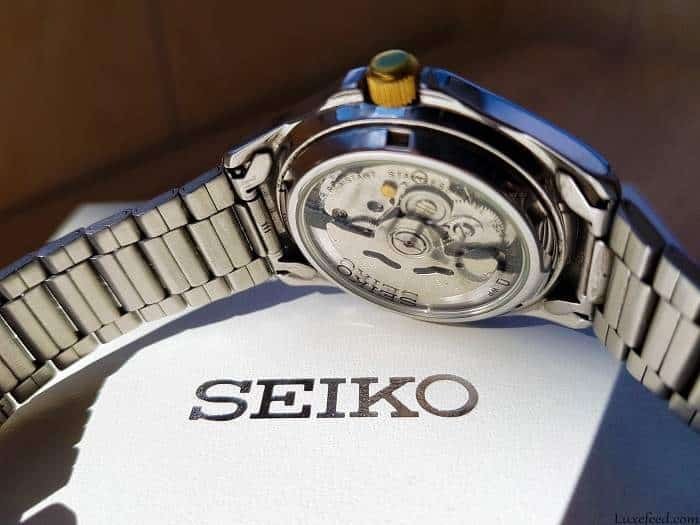 Movement: Seiko 7S26 calibre – automatic – 21,600vph/3Hz frequency – 21 jewels – 40h power reserve – average rate -20/+40 seconds per day – hours, minutes, seconds (non-hacking) and day/date complication. Strap: Stainless steel with folded links, clasp with a push-down mechanism for easy release. Reference: SNKK94 Silver/Gold (white dial) / SNKK87 Brushed Silver (white dial). 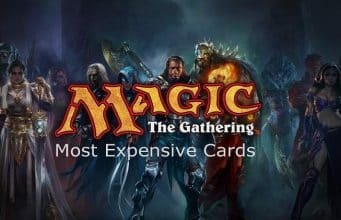 Price: USD 125 (can probably be found for less at various retailers).